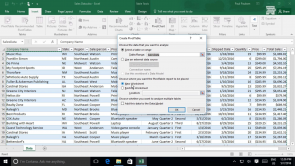 Excel 2016 includes a powerful feature that enables you to ask any number of questions of your data; get detailed, specific answers; and do it all over again in just a matter of moments. By taking advantage of the PIVOTTABLES and PIVOT CHARTS functionality, you can get critical, time-sensitive intelligence quickly, easily, and with a high-level of flexibility. Understanding PivotTables and PivotCharts is key to become an Excel Expert!